Caroline and Randy Gold had the makings of a perfect Jewish couple when they met in 2004. She was 33; he was 31. Within a year they had fallen madly in love, gotten married and were ready to start a family. As active members of their Atlanta Jewish community, they were aware of babies being born with Tay-Sachs disease to Ashkenazi parents so they asked their doctor to test them for what was then called the Ashkenazi Jewish Panel—genetic diseases more prevalent among Ashkenazim than the general population (Canavan, Gaucher, Tay-Sachs, familial dysautonomia, Bloom syndrome, cystic fibrosis, Fanconi anemia and Niemann-Pick). The good news came back: There was no carrier match and soon a healthy boy was born; today, Natanel is 11 years old. ​Two years later, their daughter Eden was born. 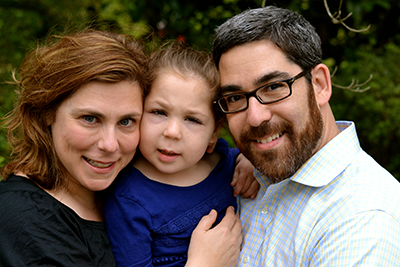 She lagged behind in her development, and then tests confirmed their worst fears: Eden had a severe neurological disorder known as ML4, a rare Jewish genetic disease that they had not been screened for. Eden, now 9 years old, cannot walk, feed or dress herself or speak beyond a few guttural sounds. How could this have happened? It was only after Eden’s birth that the Golds learned that there are dozens of Jewish genetic diseases that, back when they were tested, were unknown. They later used in vitro fertilization to have a disease-free third child; their daughter Shai is now 5. Current screening is light years away from what was available to the Golds more than a decade ago. Rapid advances in genetic sequencing are constantly identifying new diseases linked to the mating of recessive genes. And because so many couples are multiracial and multiethnic, there is now a broader pan-ethnic panel for carrier screening. This panel scans for slightly over 200 genetic mutations, many exceedingly rare. Roughly half the mutations are common among the general population and the remainder are prevalent in, but not exclusive to, the Ashkenazi Jewish community. Tay-Sachs, for example, also occurs among those with Irish, Cajun and French Canadian heritage. In the Jewish community in the United States, its incidence was greatly reduced because of screening, but there has been a recent uptick as fewer people are screening for it in the mistaken belief that it had been eradicated. Some of the diseases more typically diagnosed in Sephardi and Mizrachi Jews are alpha thalassemia, GSPD deficiency, Wolman disease and Costeff syndrome. Typically, a couple will decide to get screened when they’re considering their first pregnancy. Jill Goldberg-Ziv, 35, who lives in New York City, heard about JScreen when an ad popped up on her computer. She and her husband, Amit, 34, a computer programmer, registered because a friend had been screened and turned out to be a carrier. “I wanted to avoid a potential problem,” Jill Goldberg-Ziv says, “and I’m the kind of person who does everything online anyway, so this was perfect.” Within a month, a counselor called: Amit was a carrier for two mild diseases; Jill for none. “I can’t tell you the peace of mind that gave me,” she says. It’s far more typical for couples to find they are carriers than to learn they are matched carriers. But for those who are, the options have expanded beyond adoption. Today, matched carrier couples can produce a healthy child by one of three ways: Use an egg or sperm donor who is not a carrier. Wait until after conception and do a prenatal diagnosis through either amniocentesis or chorionic villus sampling to evaluate the fetus in utero and, if it is affected, decide whether to continue the pregnancy. Or choose IVF, where only healthy embryos are implanted in the mother’s womb. Recent news that scientists have successfully used a revolutionary technique called gene editing to alter a gene mutation in the human embryo, thereby eliminating a genetic disease, is also a promising development for carrier couples. IVF was the choice of Reform Rabbi Jennifer T. Kaluzny of Temple Israel in West Bloomfield, Mich., when she and her husband learned that they both carried the recessive gene for Gaucher. “We decided if we could do something to prevent bringing a child into this world with a disease, we would,” she says. Now they have a daughter, Bayla Shy, 7, and a son, Asher, 5, both conceived through IVF. Every person has an estimated 20,000 to 25,000 genes. At the time of conception, individuals receive half their genes from the mother’s egg and the other half from the father’s sperm. Occasionally one gene from either parent—or both—may have a mutation that can cause something as harmless as colorblindness or as harmful as cystic fibrosis. A carrier is a healthy person with one gene mutation in a set. They do not have a disease and their gene mutation can secretly be passed on for generations. But should those impaired genes from both parents link up, it will produce a child born with two mutated genes and an inherited disease. A 2014 study of Ashkenazi genetics, published by Shai Carmi and his team at Columbia University, explains why Ashkenazim are at higher risk than Sephardim. The study showed that today’s 10 million Ashkenazi Jews descend from a population of only 350 individuals who lived about 600 to 800 years ago. That population derived from both Europe and the Middle East. There is evidence that a drastic reduction in population caused generations of Jews to marry within their community, kept the gene pool from becoming diversified and allowed genetic diseases to flourish.